I love the olsenboyes too. Hope you've been having a lovely holiday weekend! I like the olsenboye ones! I love the rocker vibe that these give off! Steve wins it for me this time! Gorgeous boots. I hope you had a beautiful Thanksgiving lady! So love the Olsenboye ruggedness. I'd feel like a rockstar in the thrifty ones. I love them both--they're impressively similar! And ultimately, I think the olsenboyes get credit for using synthetic materials, which means no animals were harmed in the process . . .
Hmm, I'm a sucker for my Steve Madden boots, so they win this time. Kind of ironic the Olsen's used faux-leather actually, but it IS a low end line. Steve Madden because of the leather factor. I've spent too much already this weekend ;) Olsenboye it is! Erika, you KNOW how I adore anything Olsen! Love these boots! Steve Madden all the way! I think the Olsenboye boots look a lot more rugged. I would definitely buy those. Happy Sunday, E.
Not into this biker boot look. But the ruching on the Madden's is a bit stiff. love it!! these posts are so usefull!!!! say it also to your friends and also join my fashion blog too! those boots are awesome! i have a very similar pair with a zipper down the back instead-- i like the asymmeterical look! I really like the Steve Madden boots. I love them, and the Olsenboye is on sale for $39.99 on the site. I love a cute motorcycle boot. Mmm, I do love boots of all kinds. The Steve Madden boots are pretty gorgeous. I love the colour of them and the zips on either end. For once I am lusting over the expensive ones dammit! They are so similar. I usually go for the cheaper pair but since I adore Steve Madden and its not ridiculously priced then maybe I would choose them. oh I actually like the olsenboye a little more - something about the edges of the toe and soul I like better. Not bad for a $50 fun splurge! great find, didn't even know they had a line at JCP! they are very similiar. but i think the steve madden ones are the ones i like the most. because of the colour and that it's not as shiny as the ones from olsenboye. Such a great find Erika! These boots are so cute! 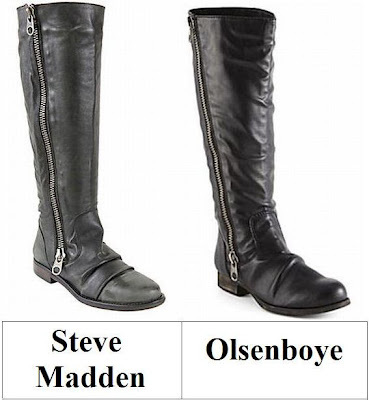 I'd probably go with the steve madden, boots are always worth the splurge! These are pretty fabulous! I think the JCP pair would actually be what I would go with. I love a good deal, as you know. i'd normally go for the steve maddens for any other shoes or heels...but since we don't get to wear boots much around here i wouldn't mind trying the olsenboyes.